We’ve all been there. Crammed into a tiny venue. Inebriation level: off the scale. Ripped posters adorn the walls with bands that have long since gone on to fill stadiums and sell millions of records. The night is going to be something totally unexpected, a list of bands trying to make their name and enrapture a new set of fans. This is what music lovers’ dream of, a new sonic explosion blasting your senses and awaking you from the cloudy booze filled haze. 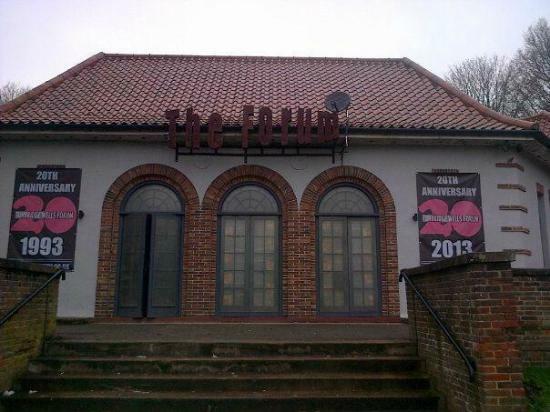 My first ever toilet venue gig was at the Tunbridge Wells Forum. A venue I still regularly attend to check out new bands and see more established young acts trying to make it. It is affectionately referred to by friends as a toilet. Not in the sense that it’s a horrible place to go or that it is in some way disreputable or dirty. It simply used to be a toilet, now converted into a thriving hub of creativity and noise. Like many smaller music venues it is under threat. The list of venues we have lost over the years is long and infuriating. Venues written into music folklore such as Newport TJs which was the place that Kurt Cobain supposedly proposed to Courtney Love. Other venues such as the recently closed Bull and Gate in Kentish Town hosted acts such as the Manic Street Preachers and Coldplay. These venues face a plethora of challenges. Some, such as the Tunbridge Wells Forum, are under threat from possible nearby residential development (for further information about this please follow this link http://musicvenuetrust.blogspot.co.uk/ ). Others are seen as ripe for conversion to suit new trends, such as the Bull and Gate converting to a gastropub (seriously?! How many does London need?!). However, ultimately, the challenge that these venues face is that consumer behaviours in relation to music and entertainment are changing. The music industry has had a tumultuous time over the past decade and is undoubtedly in transition. Album sales are on the floor and the war between artists and labels over streaming music is ongoing. You only have to look at how people reacted to Taylor Swift taking her albums off Spotify to realise that more and more people are expecting music to be free or at the very least heavily subsidised. Have people stopped going to live music? The answer is a clear no. The UK in particular has a thriving and fiercely competitive festival circuit. Big artists regularly command large sums from fans willing to traipse along to whatever concrete bunker or converted football stadium will earn the band (and label) the most money. Unfortunately, much like the endangered local pub, members of the public are now less likely to head out on masse to their local music venue on a Friday night. What people don’t realise is that without the toilet venue helping to break new acts, a lot of these stadium bands might never have existed or at the very least taken many more years to hit the top. As a music lover, I’m ending this with a plea. Support your local toilet venue. It’s a cornucopia of creativity, vitality and a part of the community. Without them, the music industry will be poorer for it and you’ll miss out on some great music.